As writing teachers, we know that writing and reading are undeniably linked in our teaching and within student learning. 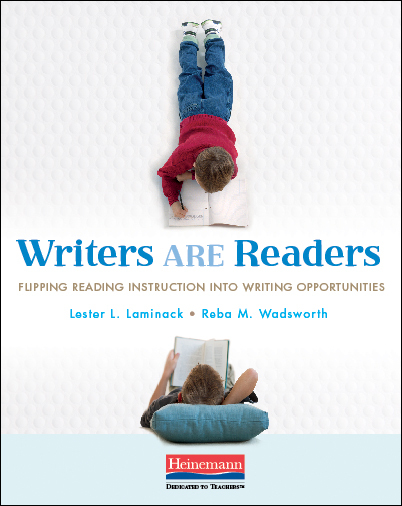 Lester Laminack and Reba Wadsworth make this abundantly clear in their newest book, Writers ARE Readers: Flipping Reading Instruction into Writing Opportunities, a Heinemann publication. What Reba and Lester have done is shown us how we can intricately weave together the processes in reading and relate them to our writing process. As I read this book, I felt like Reba, Lester and I were having a conversation. Their approach is easily digestible and informative. I loved the ease in which I was able to take a lesson and use it within my classroom, feeling supported and coached by their words. The book is broken into three main sections. Within each of these chapters, there is a sample of a reading lesson(s) followed by a “flipped” writing lesson. The writing lesson takes the concept that has been explored in the reading and demonstrates how students can apply the item in their own writing. Each chapter highlights student writing samples as well as additional mentor texts. Patrick is in the beginning stages of a detailed description. He is off to a good start considering we haven’t begun the information unit. I’m looking forward to revisiting this lesson again to see what he takes on next. I hope you will seek out this book that intertwines the teaching of reading and writing with ease. Better yet, comment below and maybe you will win a copy! This giveaway is for a copy of Writers ARE Readers, a Heinemann publication. Many thanks to Heinemann for donating a copy for one reader. For a chance to win this copy please leave a comment on this post by Wednesday, November 17th at 11:59 p.m. EDT. I’ll use a random number generator to pick the winner, whose name I will announce at the bottom of this post, by Monday, November 23rd. If you are the winner of the book, I will email you with the subject line of TWO WRITING TEACHERS –WRITERS ARE READERS. Please respond to my e-mail with your mailing address within five days of receipt. Unfortunately, a new winner will be chosen if a response isn’t received within five days of the giveaway announcement. This must be a fluid process. Can’t wait to read. Great workshop with Lester today…would love a copy of this book! Does anyone know if there will be a study guide to accompany this book? I have not heard one way or another. I can ask! This looks like a great book. I’d love to have a copy! This would be great to try in my upcoming informational unit! I am very curious about this book as I teach three sections of writing to our students daily. I have been gathering information on the importance of the reading/writing connection! This sounds like a great resource! I too am starting my unit on Informational Reading and Writing. I have been trying hard to not buy more books until I have a chance to really read the books I have from cover to cover- or rather go back for my second reading in the Close Reading framework. Think I may have to make an exception here though- sounds too close to what I have been looking for. Thanks for being such a reliable resource as I continue to develop a Workshop practice in my classroom. I’ve been looking for a guide to seamlessly teach the reading-writing connection. This is it!! I would love to use this book with teachers in my role as a literacy coach. Teachers talk often about the importance of connecting reading and writing mini lessons. A book of lessons and student writing samples would enhance our conversations! I love the idea of flipping from reading to writing so fluidly in our teaching. I’d love a copy to share with my colleagues after I devour it! Oh how my teachers could use this kind of professional learning! I would love to get the book and begin this work with them! 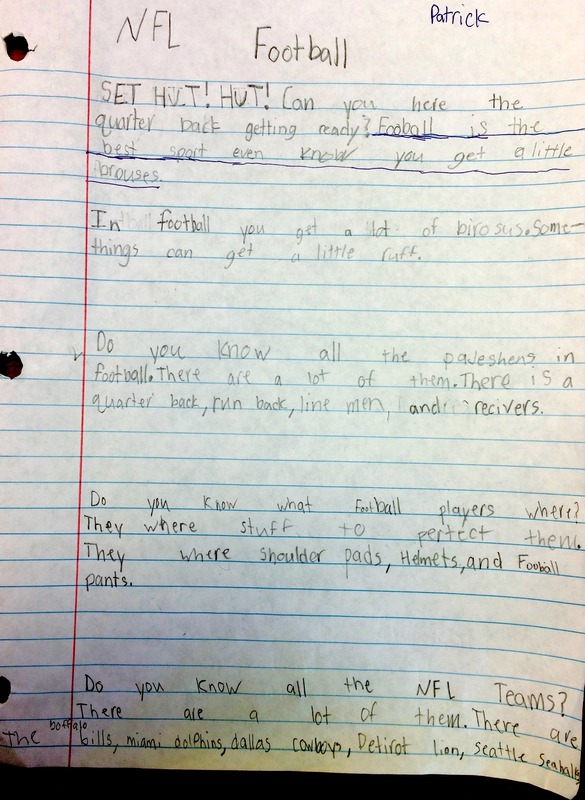 I have a lot of students writing about the NFL for their informational writing. I’m actually writing about the problem of drunk driving in the NFL. This is my favorite unit! I would love this book! This sounds like a great book…and how could it not be? Who wouldn’t want to have a conversation with Lester Laminack? He’s great! This sounds like a book that will really help me develop my students as writers. Thanks. So excited to read the new book. Went to a workshop at WRESA and loved all the ideas. Writing and Reading are so important! Using a lot of D. Miller’s whisperer ideas, and now need to add the writing component more than I do at present. Excited!! Sounds like something I’ll try. This books looks like it would be really helpful. I’d love to read it. Sounds amazing! I have been working with a third grade team of teachers on just this topics…Reading as writers and writing as readers. 🙂 This would be an amazing resource for us. Looks great! Wondering if this might work will for the same PD group of 2nd grader teachers who are discussion how to do this. We were just discussing this today after a mini lesson on character traits in the story and how well this would work to just right into a writing lesson. I have been reading The Literacy Teacher’s Playbook last night and in thinking about setting goals, new teachers aren’t always sure what a reasonable goal might be. It sounds like Writers ARE Readers will help bring concept closer and more explicitly with the three main sections. I’m intrigued! Looks like a great resource to add to my learning and understanding of reading and writing. This book sounds like it would have great ideas to get kids to think about author’s craft and how, when we read like writers, we get to notice such things. We have been working on using our Writer’s Notebooks to notice and note bits of author’s craft while we are reading, and then using this repository as we work through the process of our writing. The organization described in this book would add great ideas to our work. I love the Flipped writing lesson idea. I am fortunate to work in a district that brought several Lester workshop opportunities in the last several years. I was so excited to hear about this book a year ago on a rainy Saturday morning. I was elated to have Lesterland be our opening lead meeting this school year! I’m joining the chorus of others who think this books sounds like a great read. I love the idea of systematically linking reading and writing. I’d love to read this book. It sounds fascinating. Sounds like an excellent book. I’d love to read it. This sounds like a must have book. I have had the pleasure of hearing Lester speak about this book and would love to win a copy!! This resource sounds intriguing. Please thank Heinemann for sponsoring the giveaway. I’d love to see what Patrick’s published informational text would look like. Could it be part of a later post? As a 30 year veteran of teaching younger grades I think this is where we have gone awry!! We need to connect writing with reading in our very beginning grades. As a retired teacher who is tutoring children in reading and writing, I am ravenous to stay in the loop. I know that being on the pulse of Lester Laminack is to be on the pulse of best practice in teaching reading and writing. This book is the next must. Sounds like a useful resource! As an educator who supports teachers in the implementation of Reading Workshop, this book sounds like the perfect tool for me to use a guide for my instruction. I am new to TWO WRITERS and can’t seem to get enough. I’m about to begin an Informational Writing Unit and have so enjoyed the information I’ve gleaned from your blogs! So excited to get a look at this. Sounds like some great ways to think about our students. Always looking to connect reading and writing. Thanks for sharing. Would love this resource. Such an important mindset for first graders who often come to us believing reading and writing are separate skills. Sounds like they hit the nail on the head! I’m looking forward to reading this book. Thank you for sharing your thoughts and impressions. The book sounds great, and if it’s by Lester Laminack and Reba Wadsworth, I’m sure it is. I’ve been eyeing it for a while now. I love the idea of linking what we read with what we write. Sometimes my students see that connection, but most don’t unless I help them to. Sounds like the book would be a great help. This sounds like an excellent resource. I can’t wait to read it. It definitely sounds like a great book! Can’t wait to read it. As a literacy coach in a building, this would be great resource! Sounds like a great resource! Will have to put it on the wish list! Love this! My class has been making lots of connections between how reading can make us better writers and vice versa. Would love to read this! I cannot wait to read this book. It is a natural connection in Kindergarten! Connecting reading and writing- just makes sense! I’d love to see how this book organizes that concept. This looks so great! I always love Lester book, so I know it will be interesting to read, as well as informative. Wow!!! Another fabulous resource!!!! I cannot wAit to read . As an instructional coach I am alwYs looking for ways for our teachers to intertwine reading strategies for readers and writers workshop. This resource will definitely help us as we prepare to teach a unit on writing literary essays! It sounds like a resource that I absolutely need in my hands. Thanks for the writing sample and book outline to entice me to get the book! I am a special education teacher and have found great success in using mentor texts with my students to promote writing, as well as the reading/writing connection. Mentor texts can be a powerful tool for all students! I’ve had the pleasure of being in Lester’s sessions at Teacher’s College in the summer. Learning from him is always practical and inspiring. Love Ralph Fletcher, and I love the idea of a book that provides mentor and student examples of how this can look! My team has launched a writer’s workshop model this year and we’ve been working hard to improve our writing instruction. Next up is reading! Interesting ideas, thanks for sharing your student sample. This book sounds like another must have. This book sounds great and it is right in line in what I am trying to accomplish in my class right now. This looks like a great resource to connect reading and writing workshops and to use minutes more effectively. This sounds like a wonderful book! We are always looking for ways to connect reading and writing for our elementary students. This books sounds great! I work in a middle school and could see some of the lesson applying to this and also many ideas being used in our pull-out literacy classes. Thanks! You totally NAILED this review! I want to order one right now but I am hoping I will WIN my copy instead- I spend a chunk of my salary on classroom books and materials– like so many of us! Thanks for the detailed review. I completely TRUST and respect your opinions. This sounds like it will be my next “need to read”. I’d love a copy! This book sounds fabulous! I would love to read it. I follow Lester Laminack on Twitter and I love his passion! Building on the connection between reading and writing is a great opportunity to delve further into my student’s literacy development. Would appreciate having this book to add to my professional lending library. Definitely interested in this book. Thanks! This looks like a great resource to explore. Couldn’t be more a more timely post. My colleagues and are a planning a unit – Reading like a Writer. Can’t wait to read more. Sounds like a fabulous book. With this type of integration being the basis of all language arts instruction I am looking forward to see their ideas. I love all of Lester’s work and would love to add this to my collection. Thanks so much for once again sharing not only a great resource, but also how it’s working in your classroom! I look forward to hearing the results! I would love to use this book in the eight, 2-day grad credit writing workshops I teach each summer. This looks like a great resource as I continue to explore the reading/writing connection with my students. I am trying to incorporate writing whenever possible. I would love to see the ideas in this book! This book sounds amazing. I have been helping teachers plan in this way and having this book would be very beneficial! Love Lester and need something new by him to share with teachers – hope I am the lucky one! This looks awesome for Reading and Writing Workshop! I’d also love to introduce it to our ELA PLC. Would love to read further on how to get my students to be better writers. The third grade example is great– wish I could get some of my 5th graders to write even close to that. This would be a great book to add to my professional library. This is exactly what I need for readers’ and writers’ workshop! It looks like I have another title to add to my “to read” pile. Thanks for the recommendation! I am part of the National Writing Project this year, and I think this book would be an awesome addition to our list! I know that good writers are good readers and that the two go hand-in-hand. The title says it perfectly! I have read a sample chapter from this book and loved it! Plus, I am seeing Lester present in a few weeks! Yeah! Reading and writing connect! I am looking forward to diving deep into Lester’s newest book with Reba. Linking reading and writing instruction is the ideal– reading like writers and writing like readers. Lester Laminack is expert at unlocking the secrets of both. I can’t wait to get my hands on this book! I love how the three sections have been mapped out. While I would truly love to win a free coy, this book is now on my list of must reads. I agree with Susie, thank you for providing an example while discussing this topic! This is exactly the sort of professional text I’m looking for! We are implementing Units of Study for writing K-5 in our school this year so I enjoy reading/learning from your posts on this blog to help support our teachers/students in our new journey. Thank you for sharing! This sounds like a wonderful book full of ideas that will immediately impact the classroom. Thanks for the review. Another book to add to my Amazon wish list! Thanks for sharing. Sounds like a great book! Thanks for the review Betsy and adding another book to my TBR pile. I have found over the years, Lester never leads me a stray and helps ground my thinking. Thank you for the helpful review and particularly the example of how you used it, and your own student’s work! This book is on my wish list, but I didn’t felt like I had been overspending on professional books lately. I’m thrilled to have just a chance to win a copy. Thank you! I am so excited to read this book. I love the idea of fostering a common bond between reading & writing. LOVE the connections between reading and writing! What better way to cement our students’ learning. Thank you for sharing this great professional resource. I talk often with my teachers about making the connection between reading and writing clear to our students. This sounds like a great way to bring the connection to life for us. After 23 years of teaching, I am still always looking for new ideas. I’d love a copy of this book. I love the fact these two authors further demonstrate the connection between reading and writing. This book appears to have practical applications and examples for teachers to use with their students in the classroom. Thank you for sharing this book with us. Using mentor texts we revisit and model… What a difference in the quality!!! Thanks for the opportunity to have another great professional book on reading and writing connections. Sounds like a great book. I attempt to do these very things in connecting reading and writing. Always room to grow with new ideas. Thanks! I haven’t seen this book yet, but I totally get the concept. Reading and writing do and should go hand in hand. I believe the more we show kids how to integrate both, the better readers and writers they become. Our school;s focus for the coming year is linking reading and writing to improve our student’s writing performance. I can’t wait to read this book and see how the ideas can be incorporated into our wholeschool plans and implemented in the classroom throughout the year! This is the first resource that I have seen, in 22 years teaching 6th grade, that provides a true structured connection between reading and writing. It has always been a struggle to provide the students with an authentic writing connection to what they are reading in class and/or independently. I immediately thought of my student who love to read Mike Lupica. Can’t wait to read more of this book! Win or not, it will become part of my library. Writers are readers and readers are writers. A message I’ve always told my students. I love the idea of using reading to get at the writing strategies- that is how we get great mentor texts to look at. Sounds like a great add to my professional library! Was it only focusing on nonfiction? Our district is really stressing writing this year. This sounds like a great resource for teachers! 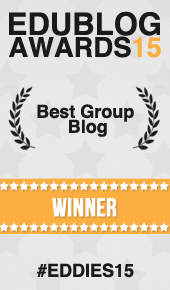 Thank you for your blogs. As a 6th grade teacher who transitioned from 2nd grade it’s so useful to see how I can use and be reminded of what worked with younger writers. What grade levels is this most appropriate for? I would say K-5 but I think many of the ideas could be stretched higher and lessons could be adapted. Lester Laminack is a masterful storyteller! My most voracious readers always struggle less with writing. I would love to read this book! Would make an excellent book study! I love this idea! So many times teachers say to me… I feel good about teaching reading, but I need help teaching writing. This sounds like this is the book to help make that connection!! Sounds like a great book! I would love to read it and incorporate her ideas into my coaching.